This subscription model customer growth calculator can be used to forecast the number of customers a subscription based business will have at the end of each month for the next 5 years. The subscription based model is one in which customers subscribe for products or services on the basis of a recurring payment plan. Many types of business utilize the subscription model for its products such as for example, software-as-a-service (Saas), and mobile and broadband services. In order to generate a viable operation the subscription business must grow its customer base to a sustainable level. The customer base will depend on the ability of the business to add and grow new customers and to retain those customers for future periods. The purpose of this subscription model customer growth calculator is to help forecast the customer base. Since many subscription services are based on monthly recurring plans, this calculator will refer to monthly customers. By entering details of the current number of customers, the churn rate, the number of additions each month and the growth rate, the subscription model customer growth calculator can be used to estimate the following. The number of customers at the end of a particular month in the future. To estimate the month in which the business will reach a target level of customers. The subscription model customer growth calculator is used as follows. Enter the number of customers at the start of period 1. In the case of a new subscription based business the number of customers at the start will be zero. For an established business enter the current number of customers. So for example, if the cancellations during the month chosen are 40 and the customers at the start of the month are 1,000, then the churn rate is calculated as follows. Enter the number of new customers added each month. The customer growth rate is the percentage by which the additions entered in #3. above grows each month. For example, if the monthly additions entered are 400, and they are expected to grow at the rate of 1% each month, the calculator will calculate the following months additions as 400 x 101% = 404, and the next month as 404 x 101% = 408 and so on. Enter a month number between 1 and 60 (5 years). The subscription model customer growth calculator calculates the number of customers at the end of the specified month. Enter a target number of customers required. The target must be higher than the starting number of customers entered in #1. If the target is not achievable within 5 years (60 months), the calculator will show a message indicating this fact. The subscription model customer growth calculator calculates the month at which the customer base reaches the target level of customers. Finally the calculator provides a graph showing the number of customers at the end of each month for the next 60 months (blue line), compared to the target level of customers (red line). The point at which the lines intersect is the month in which the customer base reaches the target level of customers. If the lines do not intersect, it means that the target level of customers cannot be met within the 60 month period, and either the subscription model inputs or the target level needs to be changed. 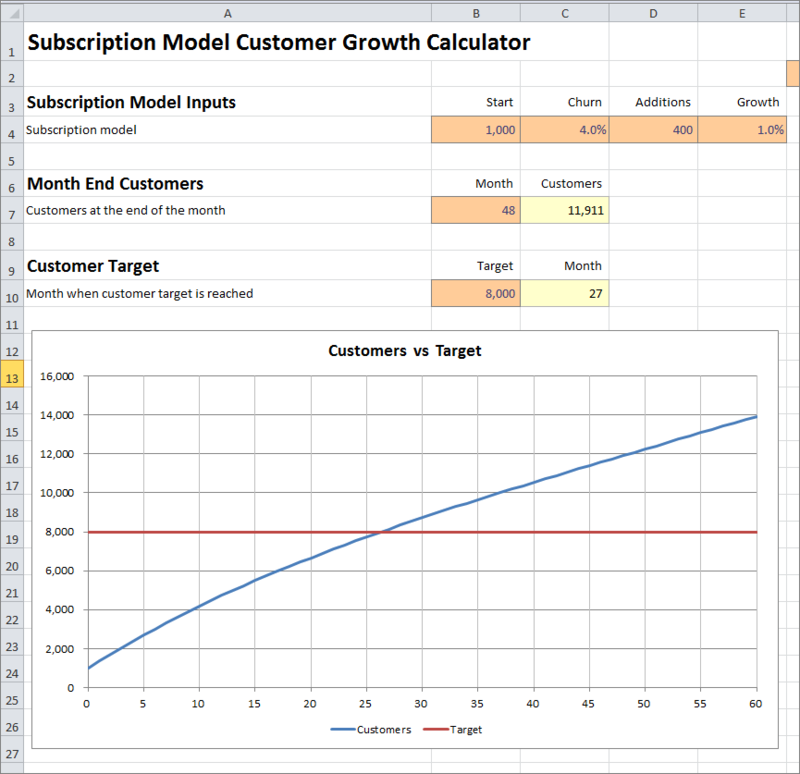 The subscription model customer growth calculator is available for download in Excel format by following the link below. Users use this subscription model customer growth calculator at their own risk. We make no warranty or representation as to its accuracy and we are covered by the terms of our legal disclaimer, which you are deemed to have read. 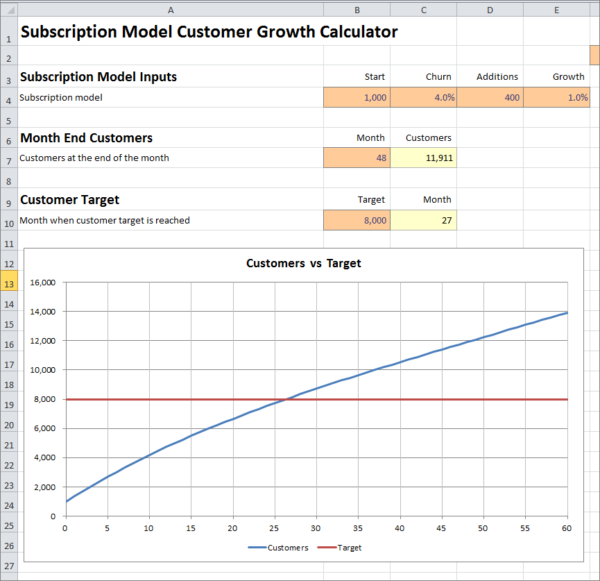 This is an example of a subscription based business customer growth calculator that you might use when preparing saas model financial projections in Excel. It is purely illustrative of user growth rate calculator software. This is not intended to reflect general standards or targets for any particular company or sector. If you do spot a mistake in the customer acquisition calculator, please let us know and we will try to fix it.